Today we had an unexpected visitor from the Lancashire Fire Service. His name was Jason and he came in to tell us about the importance of fire safety. He went through a few simple steps, so if we encountered a fire, we would know what to do. First of all he showed us a working fire alarm and then said that when we get home, we are to ask our parents to check our own fire alarms. Then we started looking at fire plans and acting them out. Alot of us did them wrong, but we now know what to do incase of a real fire. Finally, we watched a short film which showed just how quickly fire can spread. The video informed us that it only takes around 2-3 minutes for fire to spread around a room. We really enjoyed the visit - thank you Jason for coming to share this important news with us. 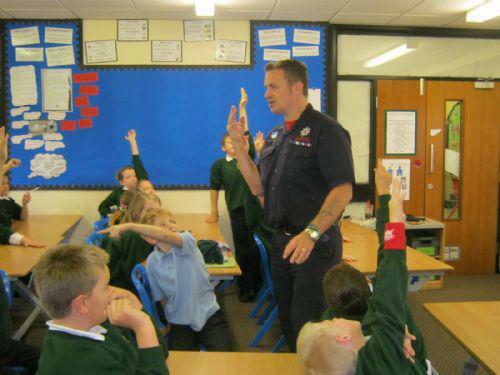 On Friday 21st September, Year 6 had a visitor - Fireman Jason. He got on with our class like a house on fire! He talked to us about the importance of fire awareness and the danger of fire. He asked us what we would do in the event of a fire, and gave out prizes for good answers. Jason also showed us a short video about about fire andhow quickly it spreads. We all learned so much from the visit and were very glad that he came.